Introduction: The role of bacterial airway colonisation in chronic stable asthma is unclear. However, there is increasing evidence for the role of bacterial pathogen-associated molecular patterns such as lipopolysaccharide in the activation of the innate immune system, which may lead to the expression of a neutrophilic asthma phenotype. Aims: We aimed to use terminal restriction fragment length polymorphism (T-RFLP) profiling to identify pathogenic bacteria in induced sputum from severe asthmatic patients and correlate findings with clinical characteristics and differential cell counts. Methods: Induced sputa were obtained from chronic, stable, severe asthmatic patients (N = 21). All patients were at BTS asthma treatment step 4 or 5 with a minimum of 6 weeks since last exacerbation. All patients were on high-dose inhaled corticosteroids and nine were on long-term maintenance oral prednisolone treatment. Sputa obtained were split for differential cell counts and 16S ribosomal DNA T-RFLP. Using this process bacterial nucleic acids are extracted from the sputum, 16S ribosomal RNA gene PCR products, specific to domain bacteria, are amplified then digested using a specific endonuclease. Ribosomal gene fragments are produced and separated by gel electrophoresis, forming a T-RFLP profile of the diversity of the colonising bacterial community. Results: 18 out of 21 specimens contained at least one of either Haemophilus sp, Moraxella catarrhalis or Streptococcus pneumoniae. The presence of at least one of these species was associated with the earlier onset of disease (p = 0.039), duration of disease (p = 0.030) and increased peak flow variability over a 2-week period (p = 0.022). There was no significant association between inhaled corticosteroid dose, maintence oral prednisolone treatment, atopy, asthma symptom scores, exhaled nitric oxide or degree of airways obstruction and colonisation with these species. Colonisation with at least one of these species was associated with significantly increased neutrophil differential cell counts (median neutrophil count 76.0% vs 38.5%, p = 0.043). Conclusion: Airway colonisation with potentially pathogenic bacteria is a common feature of severe asthma and is associated with a neutrophilic phenotype of airways inflammation. Mast cells play an important role in the pathogenesis of asthma. Human lung mast cells (HLMC) express the Ca2+-activated K+ channel KCa3.1, which is opened following IgE-dependent activation, and which promotes Ca2+ influx, secretion and migration. KCa3.1 in HLMC is closed by the β2-adrenoceptor and the adenosine A2A receptor via a Gs-coupled mechanism independent of cyclic AMP. Prostaglandin E2 (PGE2) promotes degranulation and migration of mouse bone marrow-derived mast cells through the Gi-coupled EP3 prostanoid receptor, and induces LTC4 and cytokine secretion from human cord blood-derived mast cells. However, PGE2 binding to the Gs-coupled EP2 receptor on HLMC inhibits their degranulation. In this study we have used the patch-clamp technique to measure ion channel function in isolated HLMC in response to PGE2. KCa3.1 was opened using the specific opener, 1-EBIO. Following KCa3.1 activation by 1-EBIO, the addition of 10−8 to 10−5 mol PGE2 produced rapid, dose-dependent and partly reversible channel suppression in 90% of HLMC. The addition of 10−5 mol PGE2 reduced KCa3.1 membrane current at +40 mV from 155.4 ± 20.9 to 92.6 ± 13.7 pA (p = 0.001, n = 22 cells), with a corresponding shift in reversal potential (Vm) from −69.5 ± 2.8 to –56.3 ± 3.9 mV. The selective EP2 prostanoid receptor agonist butaprost also suppressed KCa3.1 (146.0 ± 18.3 pA to 61.2 ± 6.1 pA by 10−5 PGE2, p = 0.001, n = 20). Half maximal suppression (IC50) of KCa3.1 by PGE2 and butaprost occurred at 4.0 × 10−7 mol and 2.1 × 10−7 mol, respectively. Conversely, the competitive EP1 and EP2 receptor antagonist AH6809 antagonised the suppression of KCa3.1 by PGE2 and butaprost. HLMC migration induced by chemokine-rich airway smooth muscle conditioned media was suppressed by the EP2 agonist butaprost (p<0.05, n = 4). PGE2 alone was chemotactic in high concentrations (10−6 mol, p<0.05 compared with control, n = 4). Also PGE2-dependent chemotaxis was enhanced in the presence of the EP1/2 receptor antagonist 10−5 mol AH6809 (p<0.05 compared with control, n = 4). In summary, the Gs-coupled EP2 receptor closes KCa3.1 in HLMC and attenuates both chemokine and PGE2-dependent HLMC migration. EP2 receptor agonists with KCa3.1 modulating function may be useful for the treatment of mast cell-mediated disease. Introduction: Sensitisation and allergy to the house dust mite Dermatophagoides pteronyssinus is common among patients with asthma. Injury and disruption of airway epithelium that may occur in patients with asthma potentially exposes the airway basal cells to inhaled allergens. Aim: To determine the chemokine release by primary respiratory basal cells of patients with severe asthma and healthy controls, in response to Der p 1. Methods: Eight adult patients with severe asthma and six healthy adult control subjects were studied. Bronchoscopic brush biopsies were obtained from the bronchus intermedius. From the brushing, basal cells were cultured to confluency in collagen coated glass chamber slides (Nunc) in bronchial epithelial growth medium. The cells were exposed to LoTox Der p 1 (Indoor Biotechnologies) at concentrations of 1 μg/ml and 5 μg/ml in the presence of dithiothreitol and supernatants harvested at 8 h and 24 h following exposure. Chemokines in the supernatant were measured using a multiplex ELISA-based protein array (SECTOR Imager 2400, Meso Scale Discovery). Results: Chemokine release by primary respiratory basal cells of patients with severe asthma and healthy controls in response to Der p 1 was time and dose dependent. 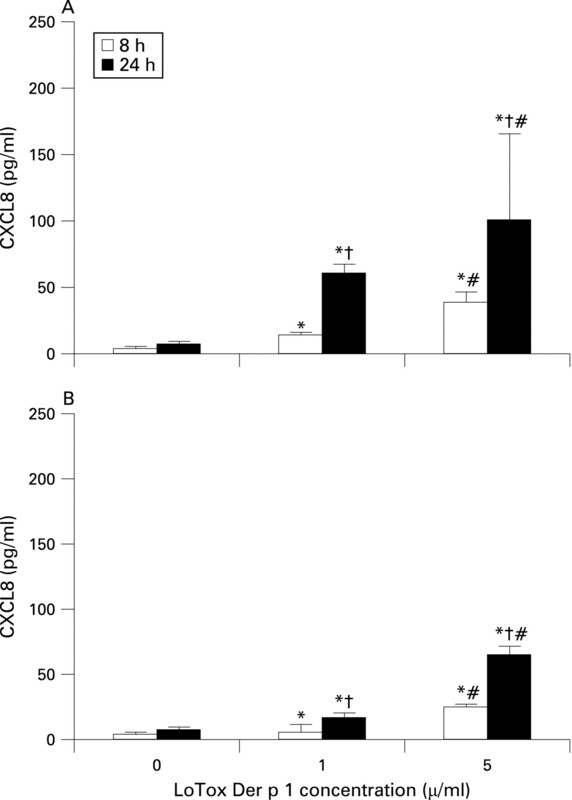 The magnitude of release of chemokines CXCL8 (IL 8) (fig), CCL4 (MIP 1b), CCL5 (RANTES), CCL11 (Eotaxin), CCL13 (MCP 4), CCL17 (TARC), CCL22 (MDC) and CCL26 (Eotaxin-3) by basal cells from patients with severe asthma, was significantly higher compared with that from healthy controls. Conclusions: Primary respiratory basal cells of patients with severe asthma and healthy controls released chemokines in response to Der p 1, in a time and dose-dependent manner. The magnitude of chemokine release from basal cells of patients with severe asthma was significantly higher compared with that from healthy controls. A defining feature of asthma is the presence of mast cells within the airway smooth muscle (ASM). These microlocalised asthmatic human lung mast cells (HLMC) demonstrate morphological features of activation with loss of granule contents; so-called piecemeal degranulation. We have previously shown that co-culture of HLMC with ASM results in the increase of mast cell numbers above control. We hypothesised that co-culture of HLMC with ASM would result in the activation and subsequent degranulation of mast cells, which could then be quantified using a histamine assay. HLMC were derived from subjects undergoing lung resection and isolated using immunomagnetic purification. ASM cultures were obtained from lung resection for non-asthmatic subjects (n = 4) and from bronchial biopsies for subjects with asthma (n = 4). We collected co-culture supernatants and harvested the cells for analysis of total histamine content and activation in the presence of IgE/anti-IgE. These were compared with fresh HLMC at day 0 and parallel HLMC cultured in SCF, IL-6 and FCS. HLMC co-cultured with ASM released significantly more histamine into the culture supernatant over 10 days (1198 ± 182 ng/106 cells at day 10) when compared with HLMC cultured alone with SCF/IL-6/FCS (35 ± 24 ng/106 cells at day 10, p<0.001). In keeping with the increased histamine content in the co-culture supernatant, the histamine content of HLMC in the co-culture was reduced to approximately half that of the control cells and the cells at baseline (1491 ± 253 ng/106 cells in co-culture, 7101 ± 1214 ng/106 cells at baseline, 4029 ± 398 ng/106 cells in SCF/IL-6/FCS, both p<0.001). Although the 10-day co-cultured HLMC contained less histamine than the day 0 controls, when they were activated with IgE/anti-IgE, the total amount of histamine released was similar to that at day 0. In addition to HLMC proliferation in co-culture with ASM, HLMC are also activated. There was increased basal histamine release, which was mirrored by a decrease in HLMC histamine content. Our data suggest that this can occur as a result of the interaction of HLMC with ASM independently of allergen and/or monomeric IgE. These activated, histamine-depleted HLMC are still able to release equivalent amounts of histamine following IgE-dependent activation indicating that they can still respond to allergen inhalation. Mast cell microlocalisation within the airway smooth muscle (ASM) bundle is a feature of asthma. We have previously shown that co-culture of human lung mast cells (HLMC) with ASM cells promotes mast cell survival and proliferation and that adhesion of HLMC to ASM is partly mediated by cell adhesion molecule 1 (CADM1). We hypothesised that ASM express stem cell factor (SCF) and that CADM1/CD117 is co-localised on HLMC; augmenting CD117 activation by its ligand SCF. HLMC were derived from subjects undergoing lung resection and purified using immunomagnetic purification. ASM cultures were obtained from lung resection for non-asthmatic subjects (n = 3) and from bronchial biopsies for subjects with asthma (n = 4). We investigated the expression of SCF on the surface of ASM cells by flow cytometry and immunofluorescence. The expression of CADM1 and CD117 was investigated by confocal microscopy and immunofluorescence on HLMC co-cultured with confluent ASM at a ratio of 1 : 4 in serum-free media over 3 days. ASM cells expressed surface SCF by flow cytometry (560.6 ± 89.79). There was no difference in the expression of SCF in non-asthmatic verses asthmatic ASM cells (p = 0.415). This was also supported by immunofluorescence (n = 4). HLMC co-cultured with ASM cells demonstrated CADM1 and CD117 co-localisation by confocal microscopy. CADM1 and CD117 expression on HLMC was closely co-localised at direct points of adhesion to ASM cells. In addition, immunoprecipitation of CADM1 resulted in the co-immunoprecipitation of CD117, also indicating the presence of a physical interaction. In conclusion, our data support the view that adhesion of HLMC on ASM via CADM1 facilitates the close proximity of HLMC CD117 and ASM membrane-bound SCF and promotes mast cell ASM interactions. Asthma is a major cause of morbidity and mortality worldwide. It is characterised by airway dysfunction and inflammation. A key determinant of the asthma phenotype is infiltration of airway smooth muscle bundles by activated mast cells. We hypothesised that interactions between these cells promotes airway smooth muscle differentiation into a more contractile phenotype. In vitro co-culture of human airway smooth muscle cells with β-tryptase, or mast cells with or without IgE/anti-IgE activation, increased airway smooth muscle-derived transforming growth factor beta (TGF-β) 1 secretion, α-smooth muscle actin expression and agonist-provoked contraction. This promotion to a more contractile phenotype was inhibited by both the serine protease inhibitor leupeptin and TGF-β1 neutralisation, suggesting that the observed airway smooth muscle differentiation was driven by the autocrine release of TGF-β1 in response to activation by mast cell β-tryptase. Importantly, in vivo we found that in bronchial mucosal biopsies from asthmatic individuals the intensity of α-smooth muscle actin expression was strongly related to the number of mast cells within or adjacent to an airway smooth muscle bundle. These findings suggest that mast cell localisation in the airway smooth muscle bundle promotes airway smooth muscle cell differentiation into a more contractile phenotype, thus contributing to the disordered airway physiology that characterises asthma.